You’ve probably seen a photo of this stunning, must-see destination even if you don’t recognize the name. Playa del Amor, the “beach of love” more typically called the Hidden Beach, is a secluded sandy cavern on one of the islands that make up Marietas Islands National Park, an hour northwest of Puerto Vallarta. The journey to the beach from Punta Mita takes just fifteen minutes. The archipelago itself is a natural wonder that was formed by volcanic activity and is now home to many different types of coral and reef fish, sea turtles, dolphins, manta rays, and eels. In the winter months, humpback whales can be seen cavorting near the shores. But the Marieta Islands’ Hidden Beach is the feature that inspires tens of thousands of tourists from around the world to make the trek. Why? The Hidden Beach is so beautiful and so magical that many people, upon seeing photographs, assume it can’t possibly be real. That’s why the best way to experience it is to see it for yourself. What Is the Hidden Beach? Picture a cave, open to the sky, in which a white sand beach meets the brilliant blue waters of the Pacific Ocean. Once upon a time this section of Islas Marietas National Park would have been totally enclosed - invisible from both sea and air - but don’t make the mistake of assuming that this wonder of the world is a natural one. More likely than not, the opening that lets the sun stream onto the Hidden Beach was created long ago by artillery tests. The Marieta Islands had no human residents, which made them an ideal location for bomb testing in the first half of the 20th century. That’s why many of the fascinating caves and rock formations on the archipelago are likely man-made. But in the 1960s, scientist Jacques Cousteau began protesting the destruction of the islands’ ecosystem, and eventually in 2005 the islands were christened Parque Nacional Islas Marietas. Once peace returned to the islands, so did the remarkable flora and fauna! The Hidden Beach is a private oasis of crystal blue waters and white sand, tucked inside a lush, tropical island. Accessible only when the tide is low, the beach itself is a dreamer’s (or a lover’s) paradise - though it is less of a secret nowadays than it once was. But does that really matter when you’re basking on the beach as the sun streams in through the vegetation-lined cave roof? You won’t be alone but you’ll feel like you’re a million miles away from your everyday life. One thing that fosters this sense of isolation is the fact that the Hidden Beach is only accessible through a water tunnel that must be swum or kayaked. It’s relatively easy to traverse (there’s approximately six feet of clearance above water level) but some visitors do find moving against the Pacific’s currents tricky and so the Hidden Beach can feel less like a destination and more like a reward. For nature enthusiasts, there can be no more perfect spot! Travelers can snorkel the coral reefs, whale watch from a kayak, swim to a sandbank that’s perfect for sunbathing and then retreat to the shade when it’s time to cool off. Simple, non-invasive activities in and around the Hidden Beach are all that are allowed in this national park to protect the flora and fauna from the type of devastation that once plagued the archipelago. The rest of the islands are off limits to visitors. 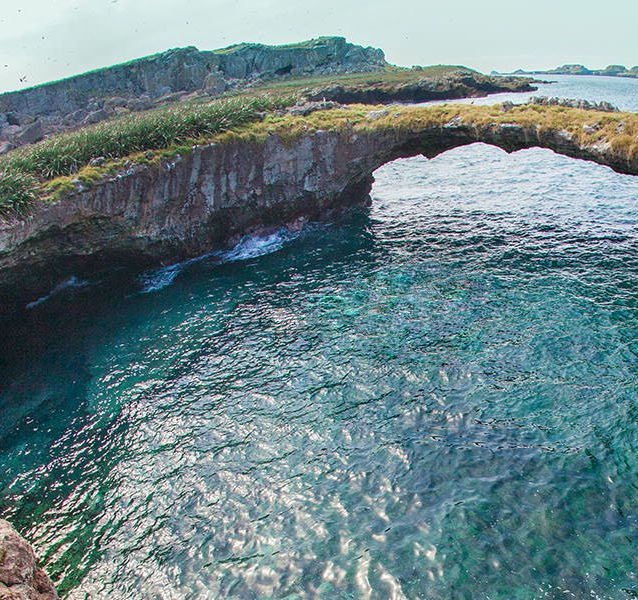 The Marieta Islands’ national park status means there is no fishing or hunting, and also that visitors must pay a national park fee that goes toward conserving this part of the Mexican national heritage. Conservation efforts have included temporary closures of the islands and their beaches to allow time for coral replanting, and finding ways to limit the impact visitors have on the natural beauty of the islands and the habitats of the 100 bird and fish species that call the islands home. Visitors must first get from Puerto Vallarta to the Marieta Islands by boat. The hour-long ride to Marieta Islands National Park from Puerto Vallarta is a pleasant journey that culminates in an exciting (but safe) swim against the current through the extraordinary sea cave. Vallarta Adventures’ Marieta Islands Hidden Beach tour is one of the best ways to see this incredible, ecologically-diverse Eden on earth, but because a visit to the Hidden Beach requires safe ocean conditions, access to the beach is never guaranteed.